Write a c program to calculate the sum of digits of a number. 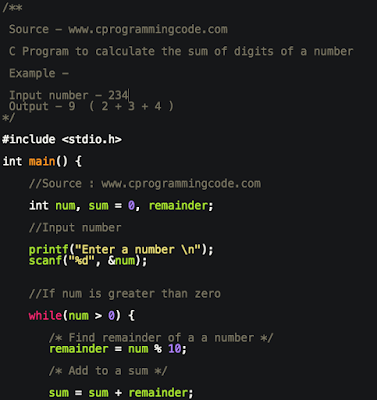 In this program, we take an input number from a user and then calculate the sum of digits of a number. i) Take an input number from a user. ii) Assign a input number in a variable. iii) Get the last digit by performing modular division i.e. digit = num % 10.
iv) Take another variable sum and assign the last digit into it i.e. sum = sum + digit. v) Remove the last digit from number by dividing the number by 10 (num = num / 10). vi) Repeat step (iii to v) till number becomes 0. After that we will get the sum of the digits of a number. In this example, we take an input number and calculate the sum of digits of a number.